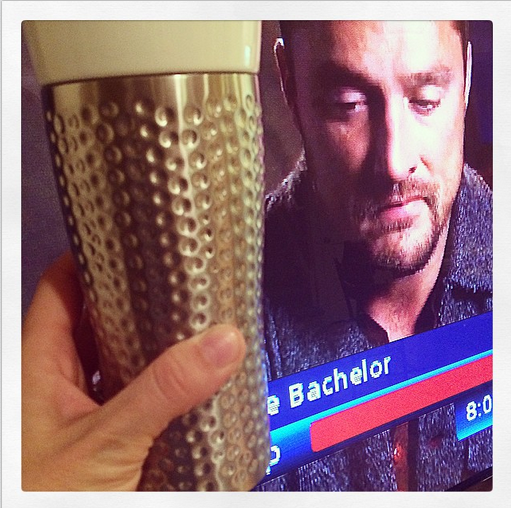 Today on #TwinTuesday, we have an iconic photo of a travel mug and Chris Soules, The Bachelor. I got a little bit sad last night because my #TwinTuesday artistic partner, LH of A Little Leeway, told me she might need to quit The Bachelor. It's too time consuming, she said. And that's absolutely true. Who's ever heard of devoting an entire three-hour evening to watching people you basically don't even like? But, the time isn't really the point. Bachelor Nation is a lifestyle, an identity that separates the best from the rest. On the travel mug side, isn't this mug sweet? It was a Valentine's Day gift from a student. I'm going on the record to say I support Valentine's Day gifts from students. Thanks, kids! The 2 Bachelorettes thing is kind of annoying. This is the best Twin Tuesday ever.